Because Delaware corporate law has virtually become national corporate law, its statutes and cutting-edge case law regarding corporations and alternative business entities have attracted practitioners nationwide to look to Delaware as the place of formation for corporations and other business entities. 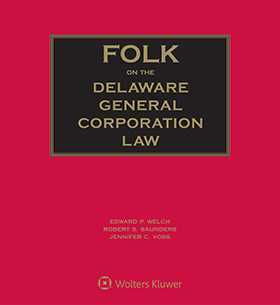 Folk on the Delaware General Corporation Law is regularly cited by courts in states other than Delaware. Its section-by-section coverage makes it easy to quickly find the complete law text and analysis, including astute commentary on recent legislation and the most significant cases (including unreported opinions) with special attention to the more complex areas of practical concern.